Lynca Meats, a company who specialises in pork cuts, has chosen Mecalux, via its partner APC Storage Solutions, to plan, build and supply them with a frozen storage installation with Movirack mobile pallet racking in Johannesburg. This solution stores 5,470 pallets weighing up to 1,200 kg each. The Lynca Meats warehouse, which runs at a steady -25 ºC, comprises 17 Movirack mobile bases that are 24 m long and 12 m high. Rack ends are equipped with four levels of consoles that facilitate the movements of workers making use of the area above the aisles. Moreover, the warehouse has a zone for future expansion where four mobile bases are installed that will provide a capacity for more than 1,000 pallets. 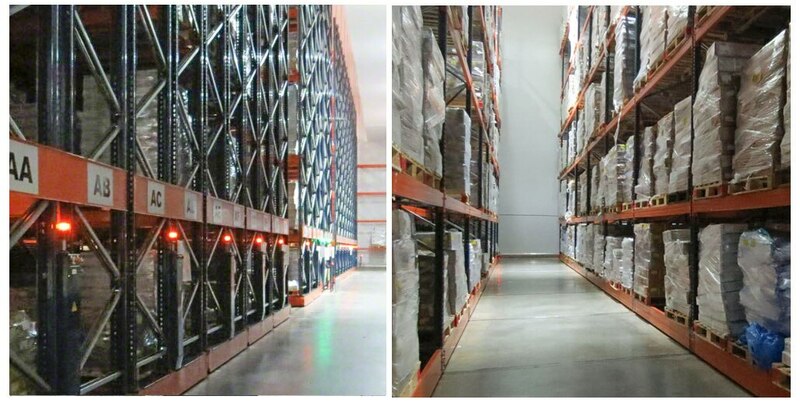 The Movirack system is ideal for maximising the available space and increasing the overall storage capacity, without losing direct access to each pallet. Also, since the high-density system eliminates unnecessary aisles, this reduces the volume needed to be kept below zero, which results in significant energy savings. The racks are placed on mobile bases that move both laterally and autonomously. To open the required aisle and extract or deposit the goods, the operator gives the command using a remote-control device. The solution is complemented by two, 27 m long pallet racks placed at the rear of the warehouse. Racks are 8.5 m high and have evaporators from the refrigeration system installed on top. Founded in 1988, Lynca Meats supplies the South African and Sub-Saharan markets with a broad range of pork-based products. Marketwide it is known for its high quality, among other traits, by fulfilling the strict and very rigorous food safety controls in countries where it does business.